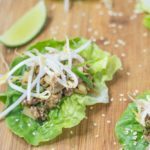 Our easy Keto San Choy Bau is ready in less than 30 minutes! It’s a classic Chinese appetizer that just about everyone loves! Place a large saucepan over high heat and add the sesame oil, garlic, and ginger, and saute for 2-3 minutes until fragrant. Add the ground pork. Break up the pork and cook until browned. Add the scallions, Keto Sweet Soy, bamboo shoots, and pepper and mix well. Bring to a simmer, then sprinkle over the xanthan gum. Continue to cook, whilst stirring, until the sauce has thickened. Remove from the heat. Taste and add salt, if needed. Stir through half of the cilantro. Place the lettuce cups onto your serving place and spoon the mixture evenly between them. Top with the remaining cilantro, the bean sprouts, and sesame seeds.